This pumpkin ice cream is delicately spiced with cinnamon, nutmeg and ginger. A small scoop along with our Poached Pears is a perfect finish to our Thanksgiving Celebration Feast. Scoop coconut milk and pumpkin out of the cans and mix well in a large bowl. Add vanilla, ginger, cinnamon, nutmeg and beat until smooth. If the coconut milk is solid instead of thick and creamy, you will need to leave it out a few minutes and/or beat the mixture well so there are no lumps. Alternatively, if the coconut milk has not be chilled, you can mix all the ingredients together and chill the mixture before putting it in your ice cream maker for freezing. Freeze ice cream according to manufacturer’s instructions. When done, scoop ice cream into a container and let harden in the freezer. 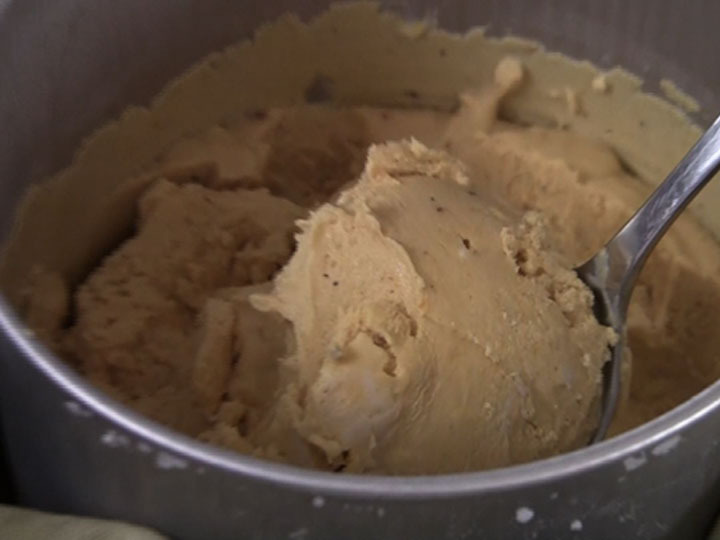 When ready to serve, leave the ice cream out a few minutes to soften up before serving. Almost a cup of sugar. Sorry, but shame on you. If this is the kind of recipes you’re going to post on this site then I’ll remove you from my rss feed. These added sugars is what’s killing us. More vegan junk food. We’ve got to be better than this. There is no room for this type of junk food in a “real” plant based diet, IMHO. Maybe replace the sugar with dates to make it healthier? Responsible Eating And Living promotes a plant-based diet of primarily organic, locally grown, whole foods. If you have listened to the over 130 IT’S ALL ABOUT ABOUT FOOD programs and any of the over 50 ASK A VEGAN programs archived on this site you would know this. We encourage people to cook without oil, salt and sugar and we show how to do it. I make a point to talk about treats on my ASK A VEGAN shows. Treats are for special times, celebrations, not for everyday consumption. Thanksgiving is a special holiday. We presented an amazing menu of delicious, plant-based foods which included dessert: poached pears with caramel sauce and pumpkin spice ice cream. This pumpkin spice ice cream is a treat, not an everyday food and a perfect finish to our Thanksgiving Celebration Feast. People love ice cream. At REAL we want people to know that they can have the same great tasting ice cream without dairy. Interestingly, of the over 100 recipes we have put on the site since we launched in July, the Pumpkin Spice Ice Cream was one of the most popular. Sure, dates are delicious, they are nature’s candy. And they can be a wonderful addition to many recipes. Dates will not always work when trying to achieve a certain taste and texture in cakes, cookies and ice cream. The vegan, organic evaporated cane juice products are ideal for replacing white sugar in these recipes. At REAL, we believe you can have your cake, your cookies, your ice cream and eat them too, knowing they are treats, for special times – while the every day diet is filled with whole plant foods: fruits, vegetables, whole grains, legumes, raw nuts and seeds. We also stress the important of dark leafy green vegetables. While going through treatment for advanced ovarian cancer in 2006-2007, I ate as many green foods as possible, ate limited grains, limited fruits – only berries, not the sweeter fruits and did not eat sugar. This was a critical time and fortunately in the past. I still eat a very green diet and juice everyday and have my occasional sweet treats for special occasions and holidays. That’s REAL. Try it Charlie and let us know how date sugar works. I’m sure it would be fine. I don’t use or eat sugar for nutrition. I use evaporated cane juice occasionally for special events. It’s a treat. I’ve made this recipe twice. Last Thanksgiving and this one. It’s something I look forward to.